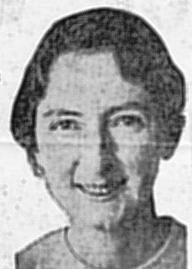 Marjorie married Ian Woodwick TRAILL, son of William TRAILL and Jessie Fraser Ramsay McCAW, on 19 October 1968 in New Zealand. There were no children from this marriage. [S542] Index - New Zealand BDMs online, at http://www.bdmhistoricalrecords.dia.govt.nz/, Death Reg. No. 2009/31878. [S542] Index - New Zealand BDMs online, at http://www.bdmhistoricalrecords.dia.govt.nz/, Death Reg. No. 2009/31878 gives this birthdate. [S982] Auckland City Council cemetery database, at https://www.aucklandcouncil.govt.nz/cemeteries/Pages/…, West area; arranged by Davis Funeral Services. [S542] Index - New Zealand BDMs online, at http://www.bdmhistoricalrecords.dia.govt.nz/, Birth Reg. No. 1892/13854, and Death Reg. No. 1989/44094 gives this birthdate. [S542] Index - New Zealand BDMs online, at http://www.bdmhistoricalrecords.dia.govt.nz/, Death Reg. No. 1989/44094. Sheila Ellen TRAILL was born in Invercargill, Southland, on 14 February 1926. [S443] CD - NZ Marriages, CD - NZ Marriages 1836-1956 V2, NZ Registrar General's Folio 16466. [S542] Index - New Zealand BDMs online, at http://www.bdmhistoricalrecords.dia.govt.nz/, Death Reg. No. 2005/18589. [S542] Index - New Zealand BDMs online, at http://www.bdmhistoricalrecords.dia.govt.nz/, Death Reg. No. 2017/22642. [S542] Index - New Zealand BDMs online, at http://www.bdmhistoricalrecords.dia.govt.nz/, Birth Reg. No. 1891/683, and Death Reg. No. 1978/45650 gives this birthdate. [S443] CD - NZ Marriages, CD - NZ Marriages 1836-1956 V2, NZ Registrar General's Folio 8101. [S542] Index - New Zealand BDMs online, at http://www.bdmhistoricalrecords.dia.govt.nz/, Marriage Reg. No. 1916/2890. [S569] Waikumete Cemetery database, at http://www.waitakere.govt.nz/cnlser/cm/cemeterysearch/…, Protestant section, Berm A, row19, plot 28. [S542] Index - New Zealand BDMs online, at http://www.bdmhistoricalrecords.dia.govt.nz/, Death Reg. No. 1973/40840. [S542] Index - New Zealand BDMs online, at http://www.bdmhistoricalrecords.dia.govt.nz/, Death Reg. No. 1978/45650. 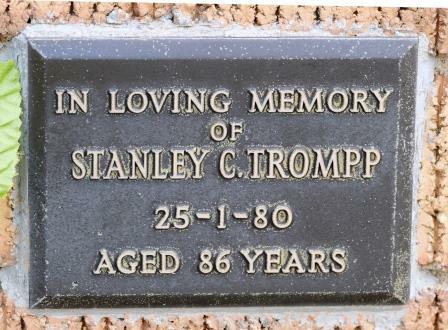 [S686] Tasmanian Southern Cemeteries database, at http://www.millingtons.com.au/cemetery-records-search/, Record No. IC44409. [S190] Index - GRO and Office of National Statistics, England & Wales Civil Registration Qtrly Indexes, Birth: District of Eastry, Vol 2a, p909, 4Q1895, mother's maiden name TRAVERS. [S760] Newspaper - The Mercury, Tasmania, issue of 14 Sep 1921. [S284] Index - New South Wales BDMs online, at http://www.bdm.nsw.gov.au, Birth Reg. No. 13972/1894. Marjorie married Stanley Robert CUTHBERTSON, son of George Lyon CUTHBERTSON and Sheila Mabel MACDONALD, in 1978 in New Zealand. Marjorie was divorced from Stanley Robert CUTHBERTSON on 26 April 1983. They were probably separated from about Feb 1981. [S542] Index - New Zealand BDMs online, at http://www.bdmhistoricalrecords.dia.govt.nz/, Death Reg. No. 1985/34036 gives this birthdate. [S542] Index - New Zealand BDMs online, at http://www.bdmhistoricalrecords.dia.govt.nz/, Death Reg. No. 1985/34036. [S488] Index - Queensland BDMs (online and fiche), at https://www.qld.gov.au/law/…, Birth Reg. No. 1894/C9302. [S183] National Archives Film - Queensland BDM Indexes, Microfilm, Reg. No. 1894/009302. [S753] Australian BDM Indexes 1788-1950, at http://www.ancestry.com/, Queensland, Reg. No. 1920/B25159, p3837. [S489] Brisbane City Council Cemeteries database, at https://graves.brisbane.qld.gov.au/, Portion 7, section 3, grave 89. [S488] Index - Queensland BDMs (online and fiche), at https://www.qld.gov.au/law/…, Birth Reg. No. 1893/C8306. [S183] National Archives Film - Queensland BDM Indexes, Microfilm, Reg. No. 1893/008306. [S488] Index - Queensland BDMs (online and fiche), at https://www.qld.gov.au/law/…, Birth Reg. No. 1899/C9101. [S183] National Archives Film - Queensland BDM Indexes, Microfilm, Reg. No. 1899/009101. [S488] Index - Queensland BDMs (online and fiche), at https://www.qld.gov.au/law/…, Death Reg. No. 1919/3714, p2025. [S489] Brisbane City Council Cemeteries database, at https://graves.brisbane.qld.gov.au/, Portion 7, section 4, grave 134.